Emmanouela Studios has been recently renovated to provide guests with independent studios and rooms that guarantee an enjoyable and relaxing stay on Santorini island. Accommodation lie in a very quiet street at the centre of Karterados village close to Fira, a few meters from restaurants, cafes, discos and the bus stop, where you can catch the bus for all beaches of the island. 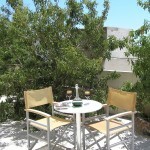 Emmanouela Studios consists of 11 well-appointed rooms, some with private balcony overlooking the Aegean Sea, and some with views of the village. All accommodation are tastefully designed according to the easy-unique cycladic style, some are traditionally furnished, some are colorful. Services meet all common standards to offer a cosy and friendly atmosphere. All rooms can accommodate up to 3 people and offer air-conditioning, colour TV, en-suite bathroom with shower, fridge, telephone and safe. We can offer 6 studios with fully equipped kitchenette amenities (use of the kitchenette is subject to extra charge) and 5 rooms/studios without kitchenette. The personal friendly attention of the owners at Emmanouela Studios will give to all visitors the opportunity to enjoy an unforgettable vacation in Santorini, the most picturesque island in Greece.